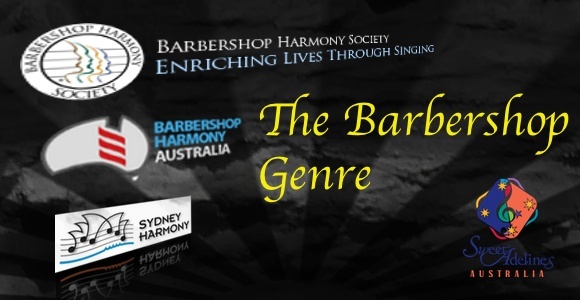 Sydney Harmony - What is Barbershop? Barbershop music is also about presentation - with choreography and sometimes props being used to enhance the score’s message and entertainment value. The ultimate aim of a great modern barbershop performance is to achieve a level of total believability between the performer and the audience. Barbershop Harmony Australia (BHA) is a non-profit organisation that represents almost 1000 male singers throughout Australia, including the members of Sydney Harmony. BHA members are amateur singers from all walks of life and across all age groups. All barbershoppers have great fun expressing themselves through music and public performances. In the process, they develop camaraderie; they bring joy to their own lives; and they enrich their family and community lives. BHA is an affiliate of the Barbershop Harmony Society (BHS) of the USA. There are many other affiliates of the BHS throughout the world in countries such as New Zealand, Ireland, the UK, Germany, Sweden and South Africa. The worldwide barbershop movement boasts some 35,000 registered members, and has recently been expanding into such diverse areas as Russia, China and Japan. Barbershop music is not just becoming more popular around the world with men, but also with women - through Sweet Adelines International (SAI). There is also a huge growth of barbershop happening with young people of both genders. Many successful Youth development programs are being run in various regions throughout the barbershop world - including here in Australia. Deke Sharon - one of contemporary a cappella's movers and shakers (singer, arranger, producer of TV show "The Sing Off" and the movie "Pitch Perfect") had this to say about the skills and benefits of singing barbershop.